My dogs have pens attached to our barn. Eventually, we plan to turn the loft of our barn into a studio and recreation area, as it is a nice wide-open area, which would provide room and a chance to 'get away' a bit, even though it is right across the driveway from the house. I've loved our barn, ever since we moved here, and our 'very-far-in-the-future' plans for this barn are very exciting to me. However, it looks like we'll have to clear out a few residents, before we can proceed with our plans. I'm thinking some durham house cleaning service wouldn't be a bad idea either! Geesh, these guys don't even pay rent! An eviction is definitely in order, then! click on this badge, and HAVE FUN!!! Ha, great capture. I am sure the critters love your barn. have a great weekend! Nice photo...but understand why they have to go! Cool image...and not only that, but your blog post title is so fitting. I love this photo! Your plans for the loft sound wonderful - what a great space that will be! Oh yeah! That would freak me right out. A loft/studio sounds like a great plan. Perhaps the unwanted residents could be given an alternative home? Hummm....a pigeon coop in the loft. Yes, they do need to go. If you clean up after them, make sure you wear a mask! 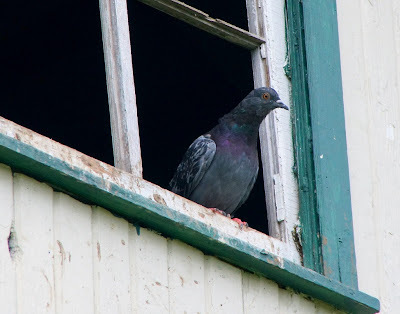 We've been talking for years about doing something interesting with the room over our garage, and we haven't gone up there to check it since we had starlings nesting under the eaves last year, so we don't know if we have a similar problem. Love it. Your future plans of a barn studio sound lovely. As I read this I am smiling, Misty. A few years ago, we purchased an old barn and "turned it into" a small getaway second home. I cannot tell you the creatures we had to evict along the way!